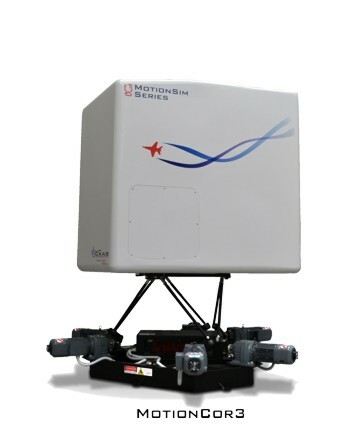 The CKAS MotionCor3 is a low to mid cost 3 or 6 degree of freedom (3DOF/6DOF) simulation platform targeted at serious simulator builders who are seeking to develop a high fidelity motion simulator of any kind for up to 2 people. The MotionCor3 comes with a choice of two different motion systems and can be turned into a motion simulator very quickly with little addition of parts from the simulator builder. The MotionCor3 system provides a solution to ALL the difficult engineering for a simulator builder, allowing them the opportunity to focus on producing the cockpit fitout (such as controls and software) to produce a high quality 3DOF or 6DOF motion simulator for any application. The CKAS MotionCor3 is based around the W10 6DOF Motion System or the U10 3DOF Motion System, which feature some incredible response and fidelity. CKAS W10 6DOF Motion System (for highest fidelity) or CKAS U10 3DOF Motion System (for mid fidelity applications). Rigid honeycomb re-enforced external cabin structure with polished industrial paint finish for the most professional external appearance, 1 access door and 3 access bay panels. Rigid prefabricated fibreglass internal projection screen structure and 3 projectors including all mounting hardware for excellent immersion offering a 30o vertical and 120o horizontal field of view. Computer is not included – The computer is provided by the customer since CKAS has no control over the final application. The computer must run Microsoft Windows XP/Vista/7 to interface with the motion system. Cockpit Hardware is not included – The cockpit hardware is purely at the discretion of the customer, since they are providing the end result simulator. Seats are not included – Due to the fact that all customers have a different specification for the type of simulator that is required, CKAS does not provide seats for the simulation platform. Internal cabin structure is not included – Due to the fact that all customers have a different specification for the type of simulator that is required (eg light aircraft or automotive vehicle), CKAS does not provide any internal cabin structure, and this must be fabricated and installed by the customer if required at all.